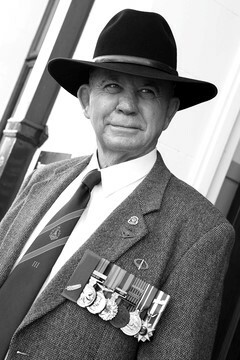 The RSL Virtual War Memorial and RSL-SA teams are thrilled that Robert ‘Dogs’ Kearney was recognised for his service to military history preservation and the community in the Queen’s Birthday Honours list. ‘Dogs’ has been a volunteer with the RSL Virtual War Memorial since retiring in November 2014 and a more generous contributor and mentor you will not find. As an author of a number of seminal military history publications, he brought to our team exceptional research skills and discipline. ‘Dogs’ is a gifted story teller who ensures that truth and accuracy are not lost or obscured. His talent is not confined to military history as his authorship extends to poetry of extraordinary beauty. His commitment to community service is the stuff of legend. Commencing with service to the nation in Vietnam this was followed by time in the army reserves, time as a manager in the SA Prison Service (during which he was commended for bravery) and finally a role as a Leadership Consultant in the SA Country Fire Service (as well as volunteer). Never one to be idle and constantly driven to make a difference he was a Founder and contributing member of Operation Flinders (http://www.operationflinders.org.au/) and more recently Trojans Trek (http://www.trojanstrek.com/). In everything he does people come first. For those of us who work with him, every day delivers moments to treasure. Despite his considerable achievements he is humble and generous. His life experiences underpin wisdom and warmth. His enthusiasm to make a difference is infectious. The RSL Virtual War Memorial and all who have the privilege of working with him have been the direct recipients of his generous gifts. We thank him most sincerely. We congratulate ‘Dogs’ (and Liz, Oscar and Izzy) on his award, recognising as it does, an outstanding contribution to community and military history.